Srinagar, Nov 09 (KNS): Chairman of Jammu and Kashmir Liberation Front (JKLF), Muhammad Yasin Malik on Friday said that exemplary boycott of recent municipal elections has frustrated India and recent upsurge in oppression across the valley is ‘a manifestation of this frustration’. “Elections under occupation have delayed the resolution of Jammu Kashmir issue and it is our national duty to remain aloof from this process,” Malik as per a statement issued to KNS said while addressing a gathering at ‘Masjid Bilal The bund’ today. Terming the ongoing oppression across the valley especially in southern, northern and central districts as ‘worst Hitlerism in the garb of democracy’, Malik said that recent exemplary boycott of municipal elections by the people of Kashmir has ‘frustrated India and recent upsurge in oppression across the nooks and corners of Kashmir is a manifestation of this frustration’. “It is our firm belief that election held under occupation are detrimental to the interests of Jammu Kashmir and it is this process which has always strengthen the hands of illegal Indian occupation here,” he said. Malik said that by issuing ridiculous and naive statements, Governor can achieve nothing but is making himself a political joker. “This kind of torture and torment has become a routine in southern, northern and central districts of Kashmir and Indian colonial authorities have given a free hand to its forces to suppress the democratic voices of Kashmiris with iron fist,” he said. “People of Jammu Kashmir who are seeking their birth right of freedom and self-determination have not been and can never be cowed down by this Hitlerism in the garb of democracy and it is our firm resolve to remain steadfast and resist this colonial mindset and ugly oppression till the achievement of the desired goal,” he said. Meanwhile, JKLF leaders and activists staged protests at Sarai-bala and Budshah Chowk against ‘ongoing Indian aggression and oppression across the Valley’. Leaders and activists of Jammu Kashmir today gathered at Sarai-bala Srinagar and Maisuma Lal chowk today and staged protest against ‘ongoing oppression unleashed by Indian colonial forces across the valley’. 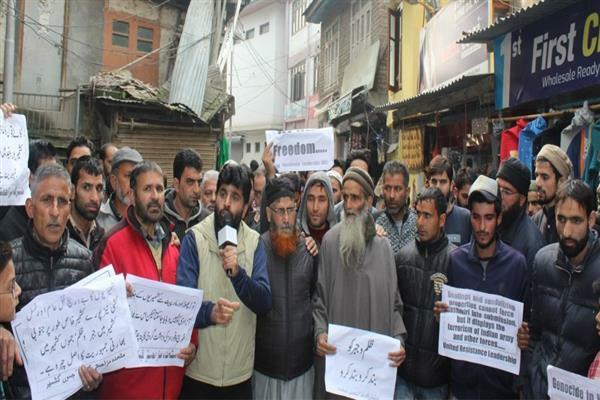 JKLF zonal president Noor Muhammad Kalwal along with Zonal organizer Bashir Ahmad Kashmiri, Ashraf Bin Salam along with scores of activists and people from many walks of life gathered outside Masjid Iqra and staged a peaceful protest there. JKLF leader Noor Muhammad Kalwal addressed people and condemned the ongoing oppression.